The Red Sea line of additives is one of our most popular lines. Red Sea has done testing to see what elements corals take up in what ratios. They then developed an entire system to keep your reef tank from being depleted of any single element, while giving your corals great health, growth, and vibrant coloration. If you want to try the Red Sea additives, then the Red Sea Coral Package is one of the best values with easy to follow instructions. Red Sea Foundation promotes healthy and vibrant corals. I have been using Red Sea Cal/Alk/Mag dosing powders for 2 years now. I can't see any reason to switch to anything else (unless they offer a 5 gallon bucket of the liquid). Yes, the Calcium does mix somewhat brown but I have had zero issues with it. For the Alkalinity, I mix in a 5 gallon bucket with a heater at 80°F and a power head in the bottom. After 24 hours, it is usually good to go. The Mag...I just dump the powder I need in my ATO reservoir and let it do it's magic that way...it's only mag. First, even the product packaging address the rust color of the CA, and the sediment of the MG. This can cause a bit of trouble clogging a line to a dosing pump, but a small inconvenience. I have a mixed reef, and had several pieces of SPS just "existing." About four months into this program, and all are quickly growing new stems from their bases. I'll continue to use for the next year. I recomend this because have a big tank And its been woorking well for me And its a good deal. Thought I would give this a try with having good reviews. Started making the calcium stock solution first and after adding 100 grams to rodi water it started turning brown with a thick rust color foam on the top. I thought it would go away after fully dissolving but it didn't. I kept adding more powder till I got to the 550 grams as the instructions state. The color just got worse. Let is sit for a few hrs and mixed it again for a couple of minutes but it stayed the same with a lot of undissolved powder still left. I went on to the alk which mixed without issues. Next up was mag. I added it slowly to the rodi water as I did with the other two but even after 12 hrs of sitting it has yet to fully dissolve. Put the jug in the sink with hot water for a hr and still left with a lot of crystals. Even went to extreme measures and diluted it 100% with boiling hot rodi water. That didn't help either. I have used brs 2 part and esv without issues. I don't know what is happening but my first impressions on this product aren't great. I've tried other companies and systems, but this program from Red Sea has them all beat. And this package makes it easy to get everything you need for a colorful and healthy setup. after just one week all of my corals are looking great. I have a frog spawn that was dying on me and now seems to complete turned around and looking good. My aquarium is small 80Gal. So I used it during 1-2yr. It is really nice stuff to coloring of coral. The foundation elements in 1kg (dry) form in this combo will make how many ML of solution? And once mixed what's the shelf life and do they need refrigeration? Great question! We recommend adding this product to a high rate of flow area using a small syringe or pipette. I purchased and just received the Red Sea Coral Package. Do all the liquids need to be refrigerated after opening? I see that at least the bottle for Reef Energy Coral Nutrition B indicates to do so on the label. Do the rest of the bottles not need to be refrigerated since I don't see that indicated on their labels? If they don't need to be refrigerated, would it hurt them to be kept in the refrigerator together with the RS Energy Coral Nutrition B? (trying to keep all of them together in one place). While it's not necessary, there's no harm in refrigerating the Coral Colors and other mineral elements. The organic nutrient supplements (Reef Energy A/B) should be refrigerated to slow their breakdown and preserve their nutritional quality. Question #1: What is the shelf life of Red Sea Reef Foundation / Coral Colors / Reef Energy / Coralline Gro Supplements? Will they spoil after a specific period of time once the containers have been opened? Question #2: I will be transporting these supplies in Midwest winter weather. If I leave them in a vehicle overnight (instead of taking them into a motel for instance) they may freeze. Will the effectiveness of these supplements be destroyed by freezing? These will all come with a very long shelf life if not indefinite All labeled within 2 years expiration. These are all elements without active ingredients and freezing will only be a major concern for breaking the bottles. Feel free to let us know if you have any further questions! 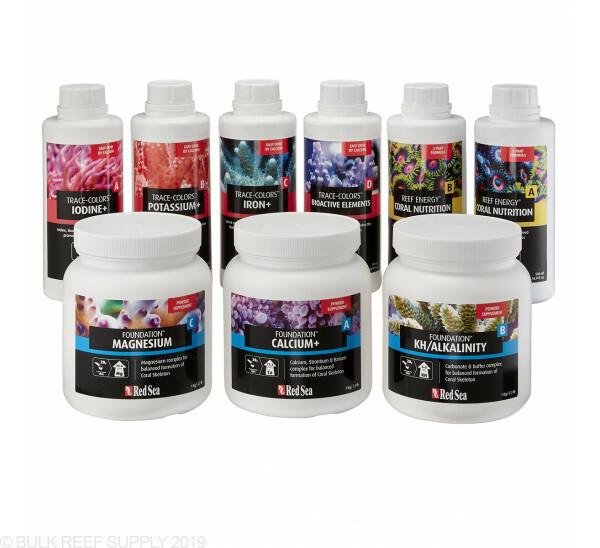 If using Red Sea Coral Pro salt mix, is this dosing system needed? I guess what I’m asking is that if you use Coral Pro, do you still see benefits from dosing their product? Thanks! It is not required but with any salt, you will need to replenish trace elements as corals consume them. 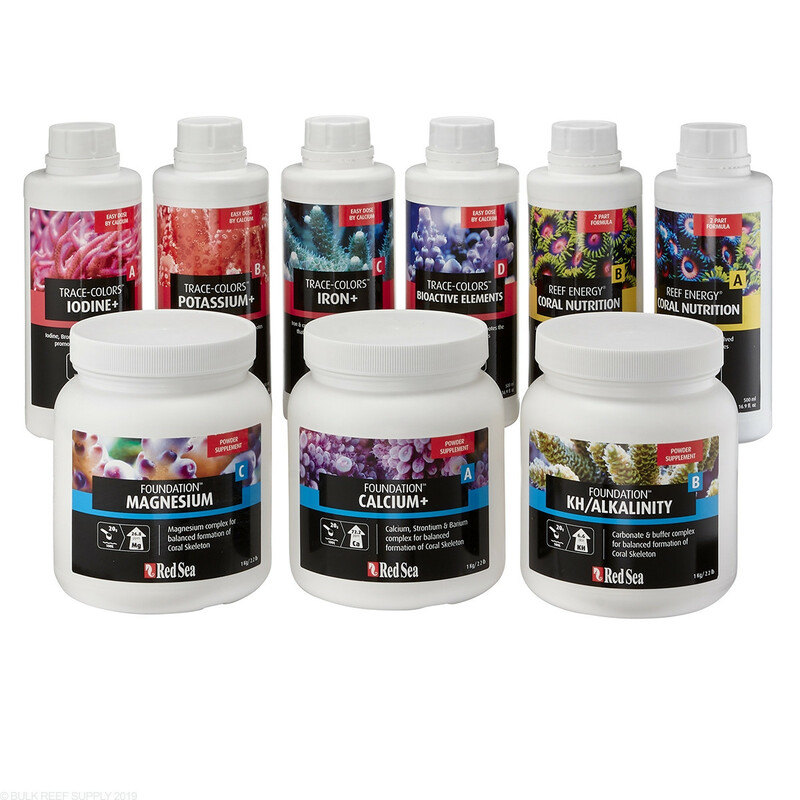 Salts like Coral pro have elevated levels that may not require you to replenish anything if you are doing normal water changes, but if you are not doing water changes, or your coral is growing rapidly a kit like this could definitely help.